The University of Huddersfield has a wide range of books available as ebooks. Our ebooks are provided by a variety of suppliers, and each ebook supplier uses a different platform. This guide provides an overview of ebooks at the University of Huddersfield, with answers to frequently asked questions. This guide also offers specific help and support for our main ebook platforms, Dawsonera, ProQuest Ebook Central and Taylor & Francis. Ebooks are accessible on Windows or Mac computers, iOS devices and Android devices. To read online you will usually only require an up to date web browser. To download each ebook platform has different computer software requirements. More details can be found in the platform specific sections of this guide. In most cases you will require a PDF reader on either a computer or mobile device. Some ebooks only work with certain software due to publisher restrictions. ebooks are electronic versions of books. You can read online or download to a computer, laptop or tablet. We have ebooks on many any different platforms. The library buys books in electronic format wherever possible. What ebooks does the library have access to? We have thousands of ebooks covering many different subject areas. A selection of ebooks should be available for most subjects and many reading list items will be available as an ebook. You can search for ebooks using Summon. If an ebook is available you will see a link to the eBook full text online as well as an orange online icon. You can also use the filters on the left hand menu to refine your search to items available online. Ebooks are available through Summon to all students and staff at the University of Huddersfield. You will be required to log in using your University username and password. 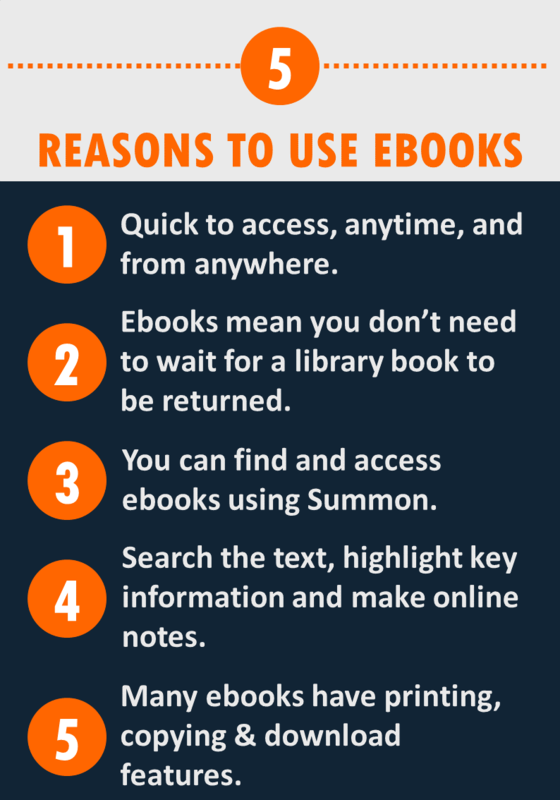 Can I access ebooks off-campus? You can access ebooks off-campus. Search Summon and you will be prompted to log in using your University username and password to access an ebook. An ebook is visible in Summon, but I can't read or download it? Please email library@hud.ac.uk to report the problem. It maybe that the amount of credits for the ebook has run out and is awaiting renewal or that there is a problem with an ebook platform. Can I copy and print from an ebook? You can copy and print from most of our ebooks, however this varies depending on the ebook platform and the publisher. You will usually be able to copy and print up to 10% of a title in accordance with copyright restrictions. For information about a particular ebook, see our guides to each ebook platform. You can download many of the ebooks in our collection. These can usually be downloaded to a computer or mobile device. However some restrictions apply depending on the ebook and the publisher. Specific software may be required depending on the platform the ebook is available from. In most cases you will require a PDF reader on either a computer or mobile device. Some ebooks only work with certain software due to publisher restrictions. University computers should have the relevant software required for accessing ebooks. On your own device you might need to install a specific PDF reader or other software.